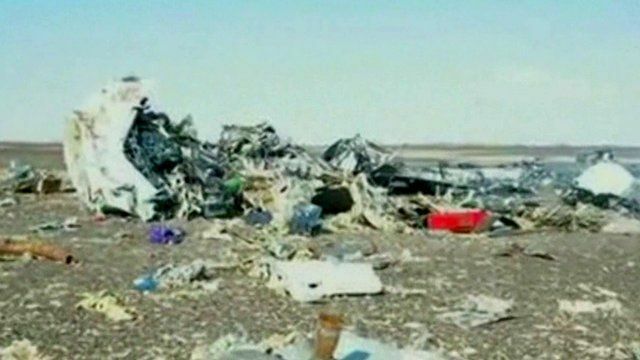 Russian aircraft 'broke up in mid air' Jump to media player An investigation is under way after a Russian airliner crashed in Sinai, killing all 224 people on board. Horror at airport as crash deaths confirmed Jump to media player A Russian airliner has crashed in central Sinai killing all 224 people on board, Egyptian officials have said. Flight tracker: 'Plane suddenly lost speed' Jump to media player Mikael Robertsson from the flight tracking service Flight Radar 24 outlines what could have happened to Russian airliner Flight KGL9268 after the plane left Sharm el-Sheikh. Plane crash: Focus on 'technical problems' Jump to media player A Russian airliner has crashed in central Sinai killing all 224 people on board, Egyptian officials have said. Russian plane crash: 'Black box found' Jump to media player A Russian airliner has crashed in central Sinai killing all 224 people on board, Egyptian officials have said. Plane crash: Putin orders investigation Jump to media player A Russian airliner has crashed in central Sinai with more than 200 people on board, the office of Egypt's prime minister has confirmed. Russian airliner crash: 'Wreckage found' Jump to media player A Russian airliner has crashed in central Sinai with more than 200 people on board, the office of Egypt's prime minister has confirmed.